Periodontal scaling and root planning are techniques used to clean the teeth, gums and roots of the teeth of the plaque and tartar that cover them and cause gum disease. Plaque is a film of bacteria and bacterial waste that forms after meals as the bacteria consume the remains of food in the mouth. Tartar is a hard, mineralized substance that results from the interaction between plaque and minerals in the saliva. Plaque can be removed by simple brushing and flossing, but once tartar develops it can only be removed by scraping it off the teeth. When you visit Arizona Periodontal Group, Dr. Trujillo will clean your teeth using a scraper to remove plaque and tartar. This is periodontal scaling, and cleans the teeth more effectively than simple brushing or flossing. This periodontal scaling gives special attention to the area where teeth and gums meet, as this is where the bacteria in the plaque can cause the gums to swell and recede – the first stage of gum disease. As gum disease develops, the gums swell and pull away from the teeth. This allows plaque and tartar to form in that gap, which causes further gum loss. If this continues untreated, the bones that secure the teeth in place will begin to decay and recede as well, ultimately resulting in tooth loss. When gum disease has progressed to this point, periodontal scaling is not enough, as that only removes plaque and tartar from the surfaces of the teeth. Root planning is the technique through which plaque and tartar are removed from below the gum line along the roots of the affected teeth. This can either be done with a traditional scraping tool, or can be done with electric instruments that break up the harmful materials through sonic vibrations. 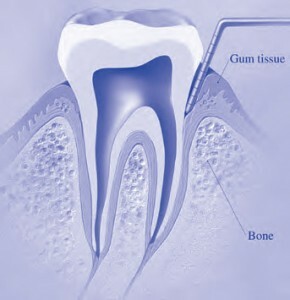 Antibacterial materials can be put in the freshly cleaned gaps to prevent further infection while the gums heal. Contact Arizona Periodontal Group today to meet with Dr. Trujillo for a teeth cleaning! Root planing can treat gum disease, but prevention is the best treatment, and regular visits to the dentist for teeth cleanings can keep gum disease from ever occurring. If you do have gum disease, come and discuss your treatment options with Dr. Trujillo, who has almost two decades worth of experience, and who can help make your mouth as good as new! Contact us today.